Box Text: Solve the puzzles and save the puppies! Patches is your name and escape is your game! You're one of the Dalmatian puppies being held prisoner by Cruella De Vil in her creepy old mansion. The other puppies are depending on you to set them free. But before you can get them out, you have to get yourself out. That means sneaking through each room. Checking out each floor. Exploring every corner. There's gotta be an escape route somewhere. And as patches, you have to find it. Cruella's two henchmen, Horace and Jasper, are on your tail. So you better get moving. Because if they catch you, they'll lock you up. And if that happens, you can kiss your spots goodbye! Explore 3-D environments so visually-stunning, your tail won't stop wagging. Search for clues and solve puzzles. It's all part of your escape plan. Encounter multiple escape routes and different game paths every time you play. Set hilarious booby traps and play funny tricks for nonstop laughs. See all the action from a puppy's point of view. It's called "Puppyvision." Follow your nose for adventure with a simple point-and-click mouse interface. Ask Wizzer for help whenever you need it. Find the combination to the lock on the old steamer trunk and discover a way to get out of the attic. Don't get mad, get even! Put Cruella and her gang away where they belong. Play a version of the computer game that Roger designs in the movie. Break the pipes in the bathroom with a wrench and make Jasper slip on the wet floor. If Horace and Jasper get their hands on you, they'll toss you in the game room and throw away the key. Creepy rooms to explore! Scary people after you every step of the way! You have to be one smart puppy to get out of De Vil Manor. 01-27-2016 aliensstudios Box Text Solve the puzzles and save the puppies! Patches is your name and escape is your game! You're one of the Dalmatian puppies being held prisoner by Cruella De Vil in her creepy old mansion. The other puppies are depending on you to set them free. But before you can get them out, you have to get yourself out. That means sneaking through each room. Checking out each floor. Exploring every corner. There's gotta be an escape route somewhere. And as patches, you have to find it. Cruella's two henchmen, Horace and Jasper, are on your tail. So you better get moving. Because if they catch you, they'll lock you up. And if that happens, you can kiss your spots goodbye! Explore 3-D environments so visually-stunning, your tail won't stop wagging. Search for clues and solve puzzles. It's all part of your escape plan. Encounter multiple escape routes and different game paths every time you play. Set hilarious booby traps and play funny tricks for nonstop laughs. See all the action from a puppy's point of view. It's called "Puppyvision." Follow your nose for adventure with a simple point-and-click mouse interface. Ask Wizzer for help whenever you need it. Find the combination to the lock on the old steamer trunk and discover a way to get out of the attic. Don't get mad, get even! Put Cruella and her gang away where they belong. Play a version of the computer game that Roger designs in the movie. Break the pipes in the bathroom with a wrench and make Jasper slip on the wet floor. If Horace and Jasper get their hands on you, they'll toss you in the game room and throw away the key. Creepy rooms to explore! Scary people after you every step of the way! You have to be one smart puppy to get out of De Vil Manor. 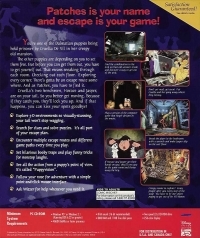 This is a list of VGCollect users who have 101 Dalmatians: Escape From DeVil Manor in their Collection. 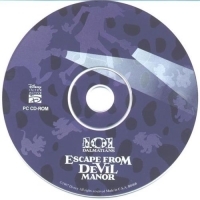 This is a list of VGCollect users who have 101 Dalmatians: Escape From DeVil Manor in their Sell List. 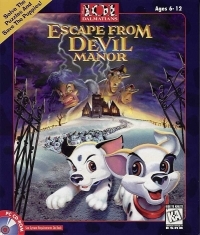 This is a list of VGCollect users who have 101 Dalmatians: Escape From DeVil Manor in their Wish List.